The USNA Parents’ Club of MS hosted the annual Christmas Dinner with 95 people in attendance at Table 100 in Flowood, MS. 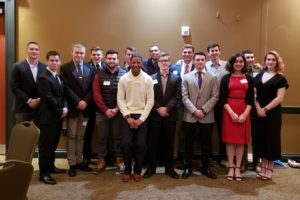 Present were 13 Midshipmen, 14 Candidates to include one from the Naval Academy Preparatory School and two from other Foundation schools, and their families. We presented US Flags flown over the United States Capital on the Navy’s Birthday in their honor to our First Class Midshipmen in attendance. We also presented Lt. Governor Proclamations to the Second Class Midshipmen for signing their 2 for 7 commitment to the US Navy or Marine Corps (two more years of school and 5 years of service). We celebrated our Midshipmen and our NAPS and Foundation Candidates that were in attendance and were able to give each Midshipman a small gift. It is wonderful to be able to get together and get to know each other better. The Parents’ Club hopes everyone who was able to attend had a wonderful evening. Special guests in attendance included Steve Guyton from Congressman Guest’s office, Bruce Proctor, David Carter and Lake Ellis, Blue & Gold Officers, and Robert Smith from Congressman Guest’s Office. We hope to see everyone at the next gathering.